Domestic dogs have been bred for thousands of years for various behaviors, sensory capabilities and physical attributes. This includes breeding dogs for herding livestock, hunting, guarding property or carriages, helping fisherman with nets, pulling large loads, and of course as companions. Male and female dogs reach puberty between 6 and 12 months. However, the time a dog actually breeds depends on different factors. Some larger dogs do not reach puberty until 2 years old. Another factor is a dog's confidence. A dog must reach a certain level of confidence before it is ready to breed. Most breeds of dogs are monocyclic, meaning they have a single cycle. Dogs show signs of "heat" about every 6 months. The reproductive cycle has four stages: anestrus, proestrus, estrus, and diestrus. The anestrus stage lasts about 2-4 months. It is when the uterus and ovaries are in a resting state. Proestrus is the stage when a bloody discharge is first released in a female dog. The bloody discharge is the beginning of "heat", which lasts usually 9 days but can last up to 28 days. The end of this period is when the female accepts a male partner. Estrus is the period when the female is sexually receptive and breeding can occur. Ovulation occurs about 24 hours after the female accepts the male. An ova, egg cell, can survive and can be fertilized 4 days after ovulation. Therefore, it is possible that a female can mate with more than one male. Female dogs have a gestation period of 9 weeks, or 63 days. Diestrus follows estrus in the non-pregnant cycle. It is when the uterus and ovaries return to the resting state. The average litter is 3-9 puppies. Smaller dogs usually produce 1-4 puppies per liter and larger breeds have been known to produced 12 puppies per liter. Females nurse and care for their puppies until they are about 8-10 weeks old. The lifespan of Dog varies depending on the breed. The median longevity, the age at which half the dogs in a population have died and half are still alive, ranges from 10-13 years. 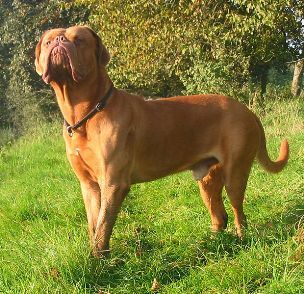 The breed with the shortest lifespan is the Dogue de Bordeaux, with a median longevity of about 5.2 years. Other breeds including miniature Bull Terriers, Bulldogs, Nova Scotia Duck-Tolling Retrievers, Bloodhounds, Irish Wolfhounds, Greater Swiss Mountain Dogs, Great Danes, and Mastiffs have median longevities of 6-7 years. The longest living breeds include Toy Poodles, Border Terriers, Miniature Dachshunds, Miniature Poodles, and Tibetan Spaniels have median longevities of 14-15 years.